On our last trip to Hong Kong, we thought we'd take a day to explore one of the other islands. 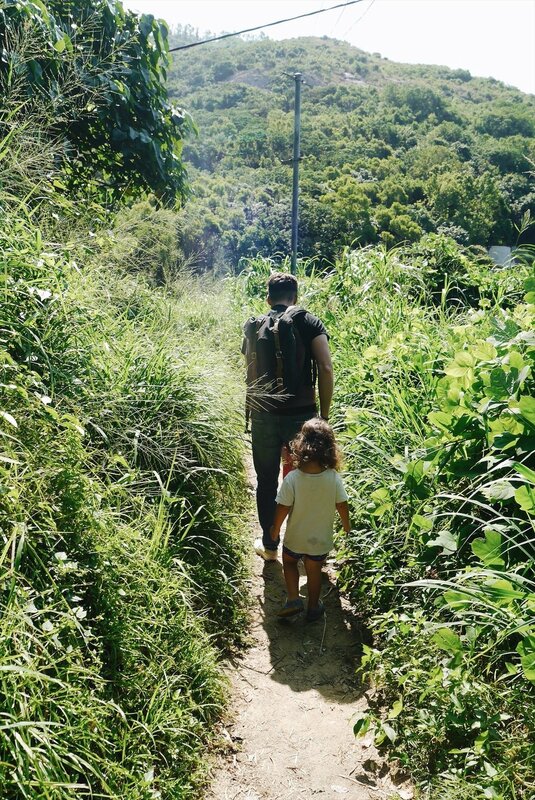 We wanted a hike that was easy enough for Oscar to walk for the most part and Oscar wanted to go to the beach, so Lamma Island and its family trail seemed like a great fit! 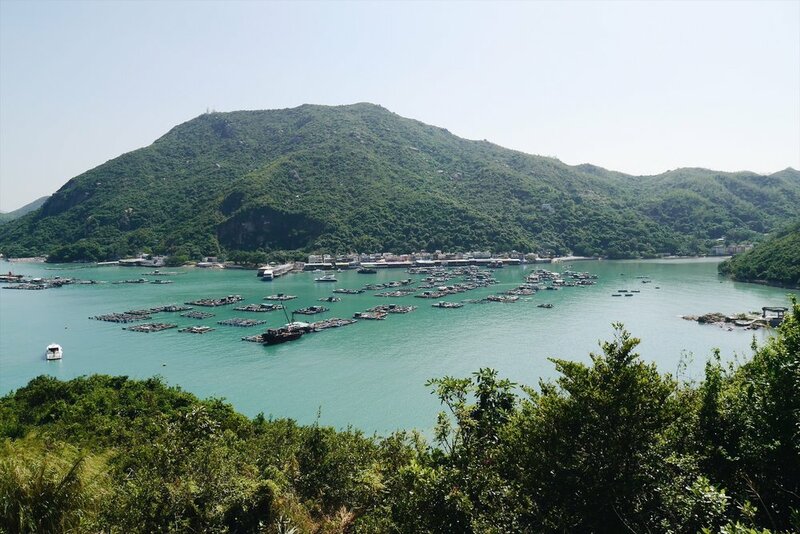 The Lamma Island Family Trail is an easy 5km (or so) walk between the two main towns, Yung Shue Wan and Sok Kwu Wan. It took us around 1.5 hours to walk the trail (with both kids walking at some point) and a stop at Lo So Shing beach for some play. We took a ferry to Sok Kwu Wan from pier 4 of the Central Piers (Central MTR). Funny story, we woke up late and realized we had 45mins to make the ferry, so we got ready and ran down the hill from our apartment in the midlevels all the way to the pier (with a pit stop at a bakery to pick up some snacks for the kids) and made it with just 10mins to spare! You can choose to start your walk from either of the two towns. We decided to go with Sok Kwu Wan for two reasons: 1) We were starting our walk early (8:30am ferry) and we read that the shops in Yung Shue Wan (the bigger town) open around 10-11am, which would be just as we were finishing our walk and perfect timing for a bit of lunch, 2) Sok Kwu Wan is quieter and is well known for it's seafood restaurants but since we are not the biggest seafood eaters, we thought it'd be best to go the other route. The ferry ride to Sok Kwu Wan was a short 30mins, we sat on the upper deck on the outside portion (I get motion sick so the fresh air really helps) and the kids loved the breeze and pointing out the sights and other boats. From there, the road is pretty well-paved and marked. We took a detour just shortly down the way to Lo So Shing Beach, where the kids spent some time playing in the sand and water. Oscar's always been a little afraid of playing in the waves but this was the first time he ventured into the water on his own and was splashing about, we were so proud of him! After about 30mins, we continued on our walk. It's a relatively pleasant walk with some beautiful views but there are a few uphill sections that were a little challenging for him. Along the way, you'll also pass by Huang Shing Yeh beach, which we stopped at for a tiny bit so Oscar could get his feet wet. We didn't stay long because it was getting pretty hot and the sun was really beating down. I should note that is very little shade along the way so be sure to take a hat and sunscreen if you're going in the warmer months. Also, I'd definitely take some snacks for the kids and water to keep hydrated! We had a spot of lunch at Yung Shue Wan, there are lots of little cafes to choose from. A little note is to make sure you check the return ferry schedule beforehand, we had to run to catch a ferry because if we missed it, the next one wasn't for another hour and a half. Of course, the kids both fell asleep on the ferry back, the lull of the boat was impossible to fight and of course, they were both pretty exhausted from their morning walk. We had a great time on our walk and would definitely recommend it if you're looking to experience a different side of Hong Kong away from the hustle and bustle.